The Nobel Prize in Chemistry was awarded last week to Dan Shechtman “for the discovery of quasicrystals”. On hearing that, no doubt some people shrugged their shoulders and thought, “You can win THE Nobel Prize for discovering not-quite crystals?” (Not quite.) While this Nobel discovery may not cure diseases, it has a very compelling history and a visual appeal that has not been captured in the Press. In 1982, Shechtman discovered physical evidence for something that science thought was impossible. He was smart enough to realize what he was looking at and was strong enough to defend the discovery. However, it was only a matter of time until someone found the physical evidence since mathematicians had proved the possibility of quasicrystals in the 1970s and amazingly artisans had conceptualized them graphically 600 years earlier. Crystallography is the study of how matter packs in 3D. For stability, solids organize in repeat patterns of a discrete unit (call this the “unit cell”) so that all atoms, in all three dimensions, are in the same pattern and are related by some sort of symmetry. The most basic symmetry is called “translational symmetry” which is like “cut and paste symmetry”. You take the unit cell and paste it to left, and then again, and then so on. In the 2D M. C. Escher image above, the unit cell is shown in red and in blue are the translated unit cells showing how the pattern repeats. Crystalline materials can also have rotational symmetry which means that if you turn the unit cell you get the same thing you started with. In the image above, the winged lions do not have rotational symmetry because they only overlay correctly if you rotate them 360*. It was believed that translational symmetry was the most fundamental ordering pattern so only rotations that maintained the cut and paste pattern were allowed, such as 180*, 120*, 90*, and 60* rotations or what is known as 2-, 3-, 4-, and 6-fold symmetry. Sven Lidin illustrates this proof and why 5-fold symmetry is not allowed in the Nobel Prize citation for Shechtman, shown below. There is some more rigorous mathematical proofs behind this, but you essentially can see the set up for Shechtman’s discovery. While looking at an aluminum-manganese material, Shechtman realized he had found 10-fold and 5-fold rotational symmetry which was thought to be not allowed. The material did have long-range order like a crystal but not translational symmetry. Quasicrystals are therefore ordered materials that lack translational symmetry. It seems like a simple concept but proving it required telling the entire crystallographic community that they had completely missed something. Luckily, art and mathematics had set the groundwork for this discovery. 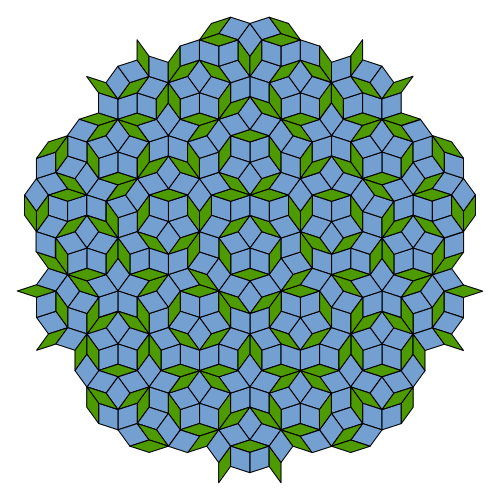 The Penrose tiling above is a 2D quasi-crystal in that it does not have translational symmetry but has long-range order and 5-fold rotational symmetry (i.e. if you turned it clockwise from one point of the central start to the next point on the central star, it would be the same). After the discovery of quasicrystals, physicists Peter J. Lu and Paul J. Steinhardt published a wonderful article in Science describing the appearance of Penrose patterns in Medieval Islamic tile work from as early as 1200 CE. The supplementary data section in this paper has some lovely architectural examples. Albrecht Dürer also drew some quasicrystalline tiles in his 1525 work “A manual of measurement of lines, areas and solids by means of a compass and ruler” which were subsequently analyzed by Casper and Fontano in 1996. It’s exciting to see places where science and art overlap. Congratulations to Dan Shechtman for the Nobel Prize and also to the mathematicians and artists who contributed to a deeper understanding of the organization of matter.